The recovery team attends to NASA astronaut Mike Hopkins and cosmonauts Oleg Kotov and Sergey Ryazanskiy after the trio's Soyuz capsule touched down in frigid Kazakhstan on March 10, 2014. An American astronaut and two Russian cosmonauts made a snowy but safe landing on Earth late Monday (March 10), bringing their 5 1/2-month mission aboard the International Space Station to a successful close. 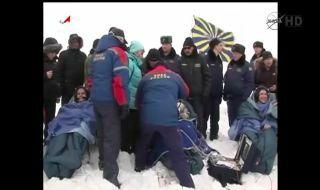 A Soyuz spacecraft carrying NASA astronaut Mike Hopkins and Russian cosmonauts Oleg Kotov and Sergey Ryazanskiy touched down on the snowy steppes of Kazakhstan at 11:24 p.m. EDT Monday (0324 March 11 GMT; 9:24 a.m. March 11 local time), about 3 1/2 hours after leaving the space station. "The crew will get a bit of a frigid welcome," a NASA commentator said as the Soyuz neared terra firma. Because of the extreme conditions, recovery teams did not set up the standard medical tents for each crewmember. Instead, Hopkins, Kotov and Ryazanskiy were to be taken immediately to a helicopter after being removed from the capsule. The trio spent 166 days in orbit, and their mission was nearly extended by 24 hours. Space station officials considered delaying the Soyuz' departure by a day because of bad weather on the ground in Kazakhstan but ultimately decided to go ahead with the original landing plan. Hopkins, Kotov and Ryazanskiy launched toward the station on Sept. 26, initially joining the crew of the orbiting lab's Expedition 37. In November, Expedition 37 transitioned to Expedition 38, which Kotov commanded. The spaceflyers enjoyed an eventful stint on orbit. For example, Hopkins and fellow NASA astronaut Rick Mastracchio performed two emergency spacewalks to fix the orbiting lab's vital cooling system. And Kotov and Ryazanskiy took the (unlit) Olympic torch on a spacewalk in November to help celebrate and generate excitement about the 2014 Winter Olympics, which were held last month in the Russian city of Sochi. The crewmembers also witnessed the first-ever trip to the space station by Orbital Sciences' unmanned Cygnus spacecraft, which made its maiden cargo delivery in January. Orbital holds a $1.9 billion contract with NASA to make eight such resupply runs. Wakata leads the new Expedition 39, currently a skeleton crew that also includes Mastracchio and cosmonaut Mikhail Tyurin. This trio will get another robotic visitor in a week or so, as SpaceX's Dragon capsule is scheduled to launch toward the space station Sunday (March 16) on its third cargo delivery mission for NASA. SpaceX holds a $1.6 billion deal with the space agency to make 12 unmanned resupply flights. The company has already completed two of those contracted missions. The International Space Station will soon be fully staffed. Another Soyuz is slated to launch March 25 from Baikonur Cosmodrome in Kazakhstan, carrying three new crewmembers — NASA astronaut Steve Swanson and cosmonauts Alexander Skvortsov and Oleg Artemyev — to the orbiting lab.